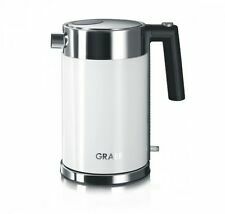 With 1.8L large capacity and 2200W high power, it quickly boils water for milk,coffee, tea, instant noodle,etc. 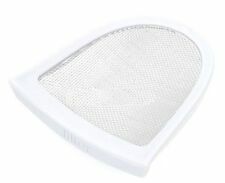 It has automatic shut-off, boil-dry protection function. The body of the kettle with LED blue light, a different visual experience. The Breville VKJ367 uses BRITA filter technology which works as the Hot Cup is boiling. How does it work?. The item will be used before but very good condition. The RediKettle by Drew&Cole is Redi when you are! RediKettle works just like a vacuum flask, it doesn't use any extra energy to stay hot for up to four hours! RediKettle Variable Temperature Thermal Kettle. You'll enjoy cleaner, tastier drinks and a kettle that lasts for longer. Type Electric kettle. Other features - Internal blue illumination. Colour Transparent with white accent. 360° rotational base Yes. 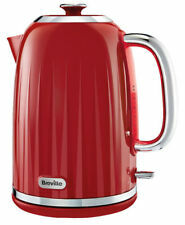 Breville VKT071 Schott Glass Jug Kettle 1.7L RRP£69. Crystal clear SCHOTT glass body and easy-grip, lift-off lid for easy, accurate filling. Super-sleek glass and polished stainless steel finish with blue on-boil illumination. BOSCH TWK8632PGB. 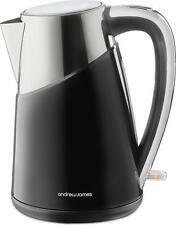 STYLINE JUG KETTLE. The keep warm function can re-boil the water to the chosen temperature for up to thirty minutes. IN TURQUOISE. Colour: Turquoise. Family Run ~ Established 1926. 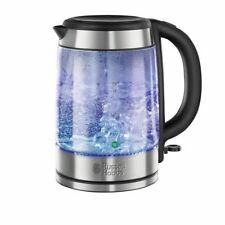 Stylish Panasonic square electric Kettle. 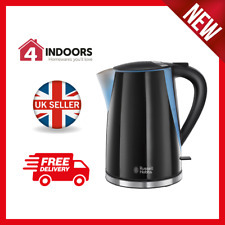 Electric kettles are known for being fast and accurate when it comes to boiling water. 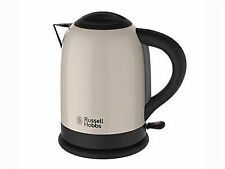 Whether you're looking for hot water for your tea, noodles, or anything else, an electric kettle will ensure that you get it as quickly as possible. 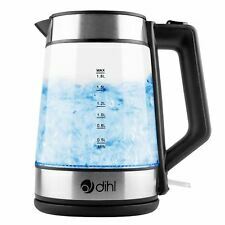 This buying guide will cover basic features and elements you can choose from so that you can confidently buy a new or pre-owned electric kettle from eBay. 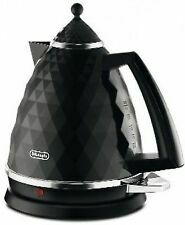 What materials are electric kettles made from? Plastic: This material is moderately durable and can be made in a variety of colours. If you're looking for a red, white, or black electric kettle, then it will likely be made from plastic. Stainless steel: These kettles are highly durable and have a strong metallic shine. They are often heavier than other materials, which is good if you want a strong, sturdy kettle. Glass: Normally, the centre is made from glass while the top and bottom are either plastic or metal. These are good for people who want an aesthetically pleasing kettle. What is the right electric kettle size? This largely depends on how much tea you intend on drinking at a time. If this kettle is only for you or you only plan on making one or two cups of tea at a time, then a smaller model should be fine. 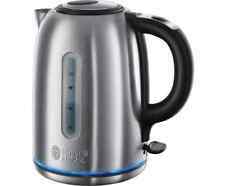 Look for kettles with a capacity of about 1 litre. If you intend on brewing more tea than this for a family, then you'll want a larger model of about 2 or 3 litres. What extra features are available with electric kettles? Keep warm: This feature will ensure that the water maintains a consistent temperature within the kettle. This is good if you have to step away for a moment. 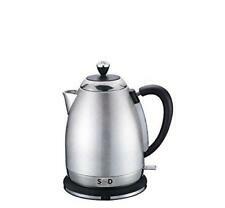 Auto shutoff: Keeping the kettle on wastes power and may even be a fire hazard. This ensures that the kettle turns off if it hasn't been used for a few minutes. Water gauge: This will show you how much water is in the kettle. If you just want to heat a specific amount of water, then this is ideal.